A new research study from the Advertising Specialty Institute® (ASI) reports sales of promotional products in Colorado are increasing at a faster rate than in any other state in the country, fueled in large part by the burgeoning legal marijuana industry. A state-by-state review of promo product growth in 2015, published by ASI’s Advantages® magazine, shows promo product sales in Colorado increased nearly 10% in 2015. And the Western region of the U.S., driven by gains in Colorado, Utah and Oregon, soared by 5.1%, the most of any region. Colorado has strict dispensary regulations in place for TV, radio, Internet and outdoor advertising, providing a lucrative opening for advertising on promotional products, which is not restricted. Logoed promotional products like pens, caps and T-shirts, along with marijuana grinders and lighters, are being distributed by dispensaries and other businesses in the marijuana industry to help advertise their brand. Over the next four years, analysts expect the U.S. cannabis industry will grow into a $40 billion opportunity, with Colorado as the epicenter. 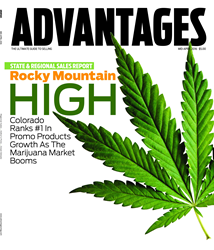 “ASI’s Advantages magazine provides a valuable business blueprint for salespeople throughout the promotional products industry, showing exactly which states and regions are growing and what new markets – like legal marijuana – to tap into,” said Timothy M. Andrews, president and chief executive officer of ASI. Nationally, according to Advantages’ annual State and Regional Sales Report, sales of promo products increased by 3.4% in 2015, to over $22.2 billion, continuing a six-year upward trend. Findings from the report were analyzed in the mid-April issue of Advantages, a B-to-B publication that provides distributor salespeople with new products, new ideas and sales strategies. The study also reports that businesses and organizations in the South led the nation in money spent on promotional products, for a total of $7.8 billion in 2015. More than 45% of total U.S. petroleum refining capacity is located along the Gulf Coast, and the largest monthly increases in employment in the U.S. occurred in Florida, Texas and North Carolina. The issue contains a state-by-state look at promo product growth in 2015 along with regional breakdowns, charts showing growing industries, forecasts from distributors, suppliers and end-buyers, as well as case studies, demographic shifts and hot new products. “As important as it is to look at the big picture, smart salespeople must look deeper at the data and the trends to stay ahead, and that’s what this special issue is all about,” said Advantages Editor Dave Vagnoni. East. The region produced 2015 promo product sales of $5 billion, up 1.8%, bolstered by higher education, medical firms and an array of startups. Midwest. Despite slipping agriculture and commodity prices, promotional product sales in the Midwest region rose 1.5% in 2015, generating $4.7 billion in ad specialty sales. West. Sales in the West grew by 5.1% to $4.6 billion, with growing tech hubs like San Francisco, Seattle, Portland and Denver showing a greater affinity for branded tech products. The Advertising Specialty Institute (ASI®) serves a network of 25,000 suppliers, distributors and decorators in the $22 billion promotional products industry.